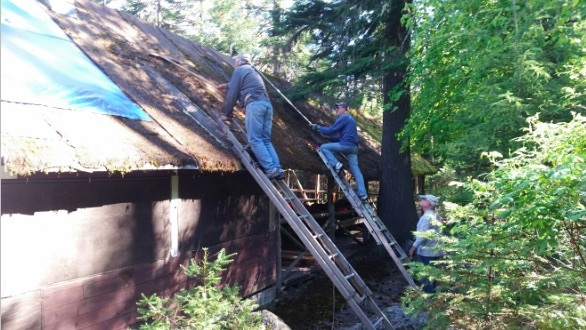 Thanks to everyone who came out and helped us at Camp Koolaree on Saturday. We had a phenomenal day. We made a very large dent in our tree situation, staff bathroom and clean up. We hope that everyone is walking OK today and that your muscles will recover soon. It is people like you that make Camp Koolaree possible. 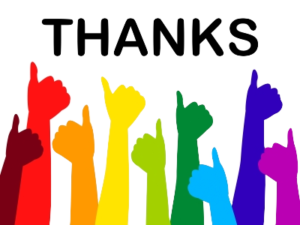 Thanks again and we look forward to working with you on future work parties. I am hoping that one more large work party will take care of our trees and we will do a few other needed jobs at the same time. I will let you know. 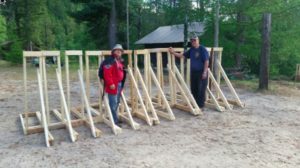 Attached photo taken at the pre-work party on Friday April 22, 2016 when Bill Furey (foreman), Herman Manarin, Len Lippa, Deon Miskell (carpenters), Don Ellis, and I (sawyers) were out at Camp Koolaree. The “Carpenter Crew” made progress on the staff bathroom project while Don and I did some chainsawing. Actually Don did the chainsawing and I made two cuts then quit after suffering a bout of vertigo that left me nauseous and wondering which way was up! Later in the day, I did feel well enough to clean the toilets and sweep out the washrooms and the “Hospital” so it wasn’t a totally useless day for me. The crew soon discovered that the old concrete floor was out of square and not level. To complicate matters, the wall of the Staff Hut wasn’t exactly plumb either. Consequently dealing with these issues resulted in a lot of head scratching and deep thinking before cutting up any precious lumber. They did pretty well to accomplish what they did. During the day we had a few light showers. Then the wind rose and started driving waves over the transom of the Starcraft. Bill and I swung the boat around so the bow was pointing out into the lake to ease that problem. But either water was getting in through openings in the motor well or the hull was leaking somewhere as Don had to do a fair bit of work with a hand pump to get the water level down. The electric bilge pump wasn’t working and using a bailer wasn’t possible. Herman is on the roof of the new staff washroom while Len (L) and Deon (back to camera) keep an eye on him. On Thursday the 28th more progress was made on the staff bathroom project. While that was going on, Bill and Don went up to the water intake to see why we weren’t getting any water pressure. They cleaned the intake screen and made some adjustments which seemed to fix that problem. Don said the creek flow was down a bit from the last visit. 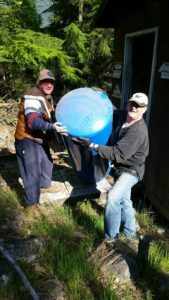 That’s Bill and Don manhandling a contact tank out of the water treatment plant. Last year there had been a leak from the tanks in the water treatment building. And by the sound of it, I had thought it was from a hole under tank #3. So Don and Bill uncoupled each tank and wrestled them outside so we could have a look. We actually found three small holes – none of which was under the bottom of tank #3! In fact, it was the least rusty of the three. Don mixed up some epoxy filler and patched the holes before the tanks were put back in place and reconnected. 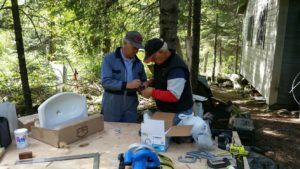 Herman and Len gluing up some fittings for the sink drain. The “Carpenter Crew” wanted to test a connection for the new bathroom and as it is fed from the potable supply, I had to fill all three contact tanks first. That took quite a while, but eventually we had the system filled. Fortunately they found that the connection was water tight. Good news. I didn’t have a look inside the bathroom, but the crew were working on installing the sink and toilet at day’s end, I believe. They want to return next Thursday, May 5th to complete the job. The guys came over to Nichawa and assisted us in getting the Starcraft Holiday 18 back on the trailer. Their help was much appreciated as Don was having some difficulty manoeuvering the boat in the narrow channel. Keeping that boat off the rocks when a breeze comes up is easier said than done. But with Herman riding shotgun in the back of my truck, I was able to back it out into a bit deeper water and he managed to guide it right into place. Bill took measurements of the roofs on the Ad Hut patio and on Cabin #6 in order to determine how much metal roofing we need to fix them. 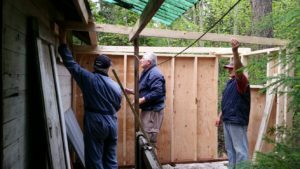 He also surveyed the bunks in the cabins to find out how much plywood would be needed to make some new sleeping surfaces. In addition, he also checked out the broken urinal in the boy’s washroom and hopes to get a local firm to donate a new one. 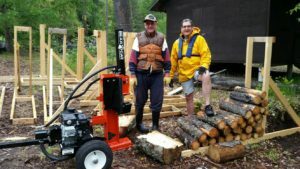 Don and Bill were able to fill out the day by hauling more cut up wood to a growing pile near the campfire pit. Ken keeps an eye on Mike (L) and Greg (R)as they use some snow removal equipment to clear moss off the roof. 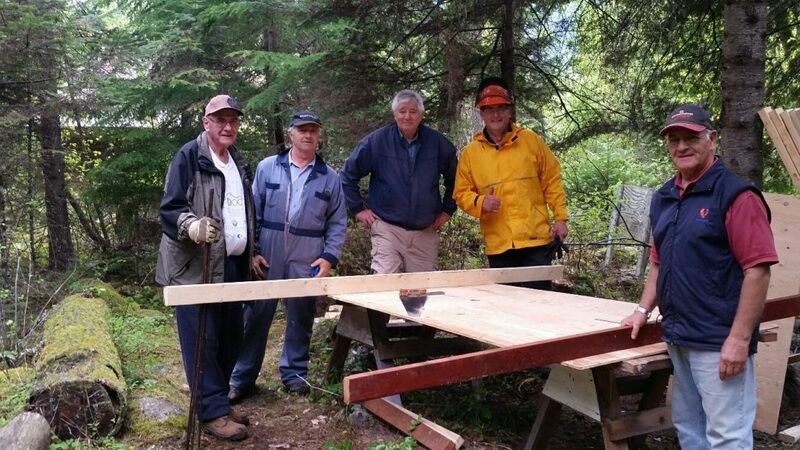 Once again Bill Furey was able to get a hard working crew together at Koolaree. This time the main project was to add another layer of roofing to the previous layers of roofing on the kitchen. 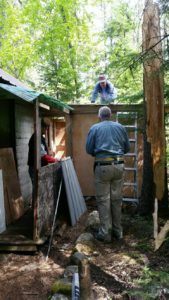 After scraping off a thick layer of moss, large sheets of lumber wrap donated by Kalesnikoff Lumber Co. were put in place and secured. It isn’t pretty, but hopefully this will keep out most of the rain this summer and possibly a bit longer. Rick, perched on a ladder, nails down a batten. Job almost done, Mike takes a turn up the ladder as Rick, Bill, and Greg stand by. We were fortunate to have Rick Miller on the job for the day. 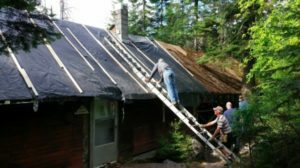 He has no fear of heights and was able to do all the fitting, stapling, and nailing along the ridge of the slippery, steeply pitched roof. 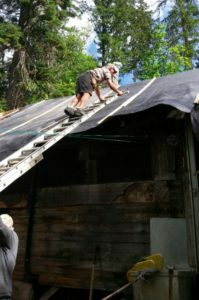 Rick was ably assisted by Mike Balahura, Greg Archibald, and Ken Brownlie who moved and secured ladders, passed up tarps, nails, and wood battens. I pitched in when I wasn’t taking photos. I did not get a photo of Don Ellis who spent much of the day chainsawing up more logs. He did appear for the odd break, covered in sweat and needing a cold drink. Good job, Don, that’s hard work! Don had to leave a bit early to attend a meeting so I ferried him back to McDonalds Landing in the Aroliner. Ken and Bill pose with the new wood pile “book ends”. Kind of looks like the starting gates at a horse race, doesn’t it? Meanwhile, Bill spent the day assembling many (it looks like 13) wood pile “book ends”. With the one previously made, there are now enough to support the ends of seven long rows of split wood. We’ll leave that task for another day. Thanks to the roofing crew for all their efforts and for staying and helping to put the Aroliner on the trailer at Nichawa. 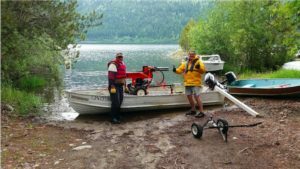 Don and Bill attempt to release and lift the Merc 20 on The Scow at Nichawa so the boat can be swung around parallel to the shore. Don is wearing water sandals and Bill is about an inch away from filling his wellies with icy lake water. Out with the old, and in with the new describes in a nutshell what happened today. In order to take the brand new 22 Ton Bear Cat log splitter to Koolaree, we first had to go over and bring back The Scow. At that point, Don immediately went to “Plan – B” and said, “We’re not going to Nichawa without a bit of ballast.” Therefore, we loaded up The Scow with that pile of junk that had been sitting at the top of the boardwalk and cruised over to the boat launch at Nichawa Road where the junk was exchanged for the Bear Cat. Bill and Don pose with the Bear Cat securely strapped inside The Scow. 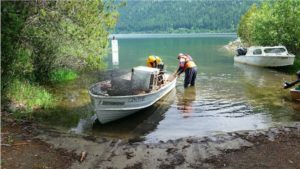 With a bit of effort, the boat was pushed out into deeper water and Don drove it across the lake to Koolaree. With the three of us pushing hard we managed to run the log splitter up some ramps and onto sheets of plywood stretched between the seats in the boat. Actually, the plywood was two “wooden mattresses” from Cabin #3 that we had borrowed. 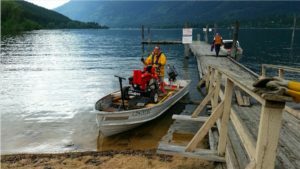 Surprisingly, the job went very well and it was not long before the Bear Cat was securely tied and on its way across the lake – slowly, that is, with the Aroliner chugging along in its wake. Don has just pulled in to the beach beside the dock at Koolaree. We would soon swing the boat around sideways and using the ramps, manhandle the heavy Bear Cat over the gunwale and then drag it up to the camp. Arriving at Koolaree, the process of loading was reversed, and in no time flat the 450 pound splitter was unloaded. With Don pulling and Bill and I pushing, the machine was moved up the hill. After rolling it into position near the big pile of wood blocks, the Bear Cat was started up and introduced to its first job – splitting a sixteen inch log bolt. Everyone had a try, and it wasn’t long before we had split a fair bit of wood. The machine works really well, and will even work better as it gets broken in. We secured it to a nearby tree and covered it with a tarp before leaving camp. About 3:30 we dragged The Scow way up the beach and left it there with the Merc 20 in place and cable locked to the boat. The fuel tank and oars were stored away in the gas shed and the plywood was returned to Cabin #3. Bill stands proudly after splitting the first block of wood with the new Bear Cat. The machine can be used with the hydraulic ram horizontal or vertical as in this photo. Many thanks to Bill and the kind people of the Castlegar Rotary Clubs who made this possible. Thanks, Don, for hauling the splitter over and for taking away a trailer load of junk. Without further ado (to coin a phrase), Don shuttled Bill and I over to McDonalds Landing and then proceeded to Nichawa where we hauled out the Aroliner and loaded Don’s box trailer with wood, ramps, fencing, cable scraps, rusty iron pipe, fridge, and even the remains of an ancient washing machine. All in all, we agreed that it had been a really successful day in spite of a few rain showers. You were wondering about the subject line, “Tommy”? Well, in honour of young Thomas who had done a magnificent job of manually splitting a huge amount of wood on our big work party, I decided to name the new log splitter after him.